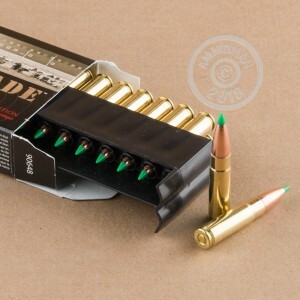 The 300 AAC Blackout cartridge was developed to allow a 30 caliber round to be fired in the standard AR-15 lower receiver while using the same magazines as the 223 Rem/5.56x45mm. This round is great for range training and target shooting, and with the proper ammunition it also suitable for hunting. 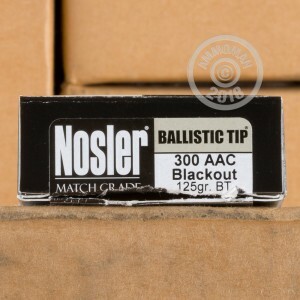 If you are looking for incredibly high quality ammo, then Nosler is the way to go. These 125 grain rounds feature ballistic tip projectiles that achieve a muzzle velocity of 2,250 feet per second. Nosler's Match Grade ammunition is loaded to extremely strict quality quality standards and utilizes premium brass cases that are boxer primed and re-loadable.